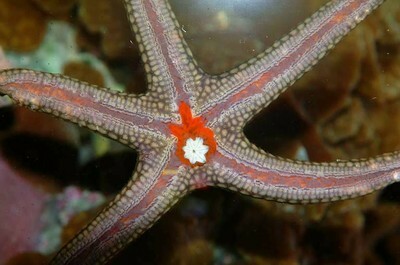 There is some controversy over the Asterina species sea stars, which can multiply to great numbers in reef aquariums. Most aquarists report no problems with them, but some claim that they eat SPS corals and make every effort to remove them. There are more than one species of Asterina and it’s speculated that some species may be harmful. It’s also speculated that the Asterina sea stars will consume SPS corals once they reach a certain density. I happened to put a Nardoa species sea star into a small reef aquarium that contains a large population of Asterina sea stars. I discovered that the Nardoa sea star regularly consumed the Asterina sea stars. The Nardoa sea star san be a good biological control for those aquarists that want to reduce their population of Asterina sea stars. The pictures were taken as the Nardoa was eating Asterina sea stars on the glass walls of the aquarium. I used a Fuji S1 digital SLR camera, with flash at a shutter speed of 1/125 second and an aperture of F16, to take the pictures.